The first time we heard the loud “BANG!”, we jumped up. What was that? A few hours, we were startled again. After a few times, we realized, it were the green fruits hanging in that huge tree in our front yard that were falling and banging on the roof of our house. These green fruits with a leather-y kind of skin, some apple shaped, others more oval, kept on bouncing on our roof and we started to get curious. What are these fruits that the tree is loaded with? And .. are they edible? We cut one open to reveal the inner white flesh. It was juicy, creamy even, and smelled sweet. Trying to find out online on a few tree determination websites didn’t gave us the answer. Following the flow chart that described the leaves, we didn’t find a match for the fruits. So we took a few pics and posted our question on Nextdoor, the neighborhood forum where you get updated on all lost cats and dogs, decisions of the city council that people don’t agree with and everything else you might want to share with your neighbors. “Sapotes, maybe?” “Definitely sapotes.” “White sapotes, and yes, they’re edible“. Within an hour after posting my question what these green, juicy fruits were that we’re falling off the huge tree in our front yard, I got my answers. My neighbors on Nextdoor told me all about it. “They are hard to grow, but they do well in Southern California“, one of them added. 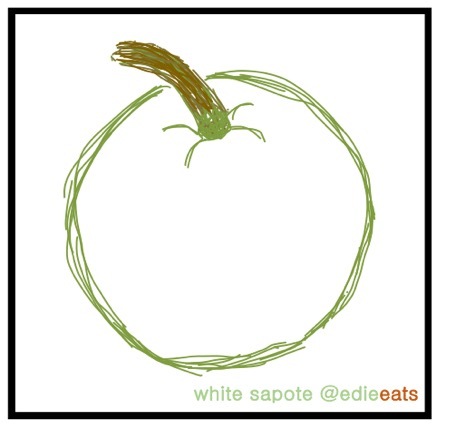 White sapotes have a sweet taste, with hints of vanilla, banana and a slight bitterness. They’re creamy like avocados, but soft like mango’s and juicy like ripe pears. We picked up all the fruits we could before it became too dark and collected them in a huge bin. I put them in paper bags and put them in front of my neighbors’ doors with a little note. The curious delivery guy ended up with getting a few. My friends I’m sitting down with to get this blog post out, will bring a huge bag home. And if you’re attending one of my cooking classes at my regular places (you know where they are) this month and are interested: let me know and I’ll bring a bunch! 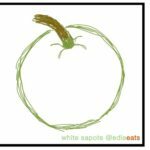 So what can you do with white sapotes? Not much; all advised to keep it simple and don’t cook them not to loose their flavor. Put some on your morning yogurt or granola. Chill the ripe ones in the fridge or freezer and eat as dessert. Make a smoothie, like my Strawberry Sapote Smoothie below. Clean (you don’t eat the green skin and the pits), chop and freeze to save for other seasons. And that’s what I’ll be doing until the tree is empty and we don’t get aroused by the bangs on our roof anymore. Okay, technically it’s not a smoothie (because, no dairy), but this creamy, thick and luscious drink is just like a smoothie. You can used (nut) milk, I only used orange juice because I had some leftover after my guests had left. * 1 cup orange juice. Clean and chop the fruits into smaller pieces. Dilute with the orange juice until smooth and drinkable to your liking. I have a small white sapote in my backyard but seem to have missed all the fruit while I was traveling. Now I know what to look for next year! Too bad, Stacey, cause they are delicious!